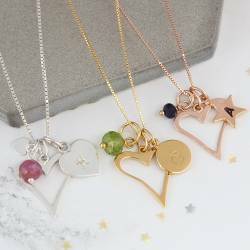 The price is for one star charm with a zodiac sign stamped onto it. The loop on each sterling silver star is rigid, so you may have problems fitting it on any chain except those from Bish Bosh Becca. The sterling silver star is approximately 12mm, with the loop it hangs approx 16mm from the chain.